Congenital Nevi: Moles present at birth. The larger their size, the greater the risk for developing into a skin cancer. Atypical Dysplastic Nevi: Irregularly shaped moles that are larger than average. They often appear to have dark brown centers with light, uneven borders. 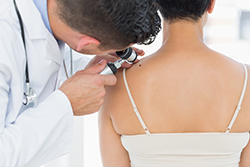 Higher Frequency of Moles: People with 50 or more moles are at a greater risk for developing a skin cancer. If any of these conditions occurs, please make an appointment to see one of our dermatologists right away. The doctor may perform a biopsy of the mole to determine if it is cancerous and/or may surgically remove it.